The mother of a man who survived last year's gun massacre in Las Vegas only to be killed by another gunman in a California bar this week has made an impassioned plea for gun control. In a video clip that has been widely shared, a distraught Susan Schmidt-Orfanos rejected the habitual calls by politicians for "thoughts and prayers" after the shooting in Thousand Oaks, California, that left her son and 11 others dead. "My son was in Las Vegas with one of his friends and he came home. He didn't come home last night," Ms Schmidt-Orfanos said. Her son Telemachus was a 27-year US Navy veteran. The gunman who attacked the Borderline Bar and Grill on Wednesday night was identified as 28-year-old Ian David Long, a US Marine combat veteran who had served in Afghanistan. Police said he appeared to have taken his own life after opening fire on the bar's patrons. A doorman at the bar and a police officer were among the dead. US President Donald Trump told reporters the gunman was "a very sick puppy. He's a sick guy." US media said a number of the young people who were at the shooting in California survived the Los Vegas attack. However implementation of the ban was blocked by a lawsuit filed by the California Rifle and Pistol Association, the state branch of the National Rifle Association, or NRA, and five Calfornia residents, media reports said. Ms Schmidt-Orfanos said she doubted that any gun control laws could be effectively enforced in the current political climate, citing the lack of action after the 2012 shooting in the Sandy Hook elementary school in Connecticut that left 26 dead. 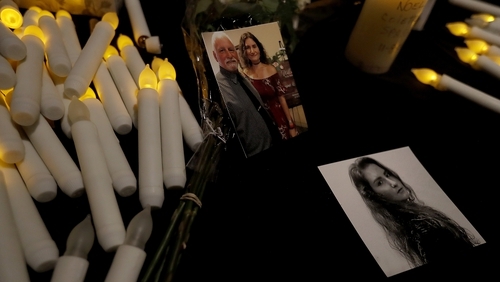 Friends, family and communities gathered last night at multiple vigils in southern California to mourn the 12 people killed when a gunman opened fire in bar on Wednesday. More than 2,000 mourners came together at the Thousand Oaks Civic Arts Plaza, holding candles to pay their respects. Many of the victims were students at local colleges including Pepperdine University, Moorpark College and California State University Channel Islands. Others packed a church at California Lutheran University for a service.